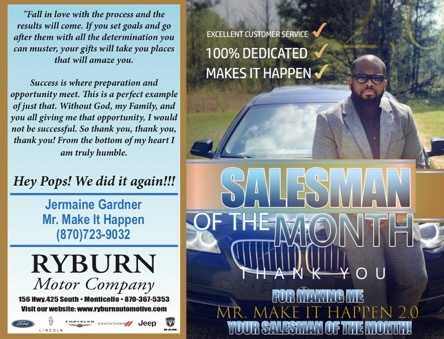 Jermaine Gardner, Salesman of the Month at Ryburn Motor Co. This entry was posted on Friday, February 8th, 2019 at 12:42 am	and is filed under Business Center Ad. You can follow any responses to this entry through the RSS 2.0 feed. You can leave a response, or trackback from your own site. Way to go Jermaine!!! You are a wonderful salesman who truly cares your customers. Anyone needing a vehicle should go see all the great staff at Ryburn Motor Company. You could not ask for a better group of Sales Consultants to serve you.